1.	International Travellers whose sole objective of visiting India is recreation , sight seeing , casual visit to meet friends or relatives, short duration medical treatment or casual business visit. 2. Passport should have at least six months validity from the date of arrival in India. The passport should have at least two blank pages for stamping by the Immigration Officer. 3.	International Travellers should have return ticket or onward journey ticket,with sufficient money to spend during his/her stay in India. 4.	International Travellers having Pakistani Passport or Pakistani origin may please apply for regular Visa at Indian Mission. 5. Not available to Diplomatic/Official Passport Holders or Laissez-passer travel document holders. 6. Not available to individuals endorsed on Parent's/Spouse's Passport i.e. each individual should have a separate passport. 7. Not available to International Travel Document Holders. 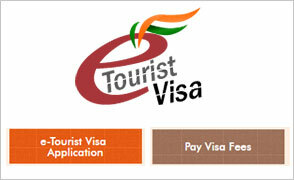 1.	e-Visa has 3 sub-categories i.e., e-Tourist visa, e-Business Visa and e-Medical visa. A foreigner will be permitted to club these categories. 3. Recent front facing photograph with white background and photo page of Passport containing personal details like name, date of birth, nationality, expiry date etc are to be uploaded mandatorily by the applicant. Additionally one more document depending upon the e-Visa type would also be required to be uploaded. The application is liable to be rejected if the uploaded documents and photograph are not clear / as per specification. 4.	e-Visa fee is country/Territory specific. Bank transaction charges of 2.5% will be charged additionally on applicable e-Visa fees. The fee must be paid at least 4 days before the expected date of travel otherwise application will not be processed. To know the fee applicable on your Country/Territory please Click here . 5.	e-Visa fee once submitted is non-refundable as the fee is for processing of the application and is not dependent on either Grant or Rejection of Electronic Travel Authorization (ETA). 7. Biometric details of the applicant will be mandatorily captured at Immigration on arrival in India. 8. The validity of e-Visa will be 60 days from the date of arrival in India.Double entry is permitted on e-Tourist Visa and e-Business Visa. Triple entry will be permitted on e-Medical Visa. 9.	e-Visa is valid for entry through 24 designated Airports (i.e. Ahmedabad, Amritsar, Bagdogra, Bengaluru, Calicut, Chennai, Chandigarh,Cochin, Coimbatore, Delhi, Gaya, Goa, Guwahati, Hyderabad, Jaipur, Kolkata, Lucknow, Mangalore, Mumbai, Nagpur, Pune, Tiruchirapalli, Trivandrum & Varanasi) and 3 designated seaports (i.e. Cochin, Goa, Mangalore). However, the foreigner can take exit from any of the authorized Immigration Check Posts (ICPs) in India. 11. e-Visa can be availed for maximum of two times in a calendar year i.e. between January to December. 1. This site is best viewed in Mozilla Firefox,Google Chrome,Internet Explorer (Windows) version 9.0 and above. 2. The applicant must also have Adobe Acrobat Reader version 7.0 or higher installed on your PC in order to download and print the completed application form. 2. What are all the payment modes available on SBIePay payment page? 3. Are transactions on SBIePay secure? 4. Can International payments be processed? 5. How a customer/applicant can understand that payment has been made successfully? The applicant after filling details on https://indianvisaonline.gov.in/ and clicks “Pay Now”. The applicant is redirected to SBIePay payment page and is presented with payment options like MasterCard and VISA. Applicant enters his card details and clicks “Proceed”. Then the applicant may see one of the two options: i. 3 D Secure page of the Card issuing page for inputing 3D Secure password/OTP ii. Transaction is processed without 3D Secure page. After successful completion of transaction, the applicant is redirected on to the https://indianvisaonline.gov.in/ with a successful receipt of payment. 6. How do I know that my Bank participates in 3D Secure transaction? 7. What if a successful page on https://indianvisaonline.gov.in/ is not shown after completing the transaction? 8. How are Refunds processed? 9. What are the banking charges for e-Tourist Visa fee? The banking charges are 2.5% on the applicable e-Tourist Visa fees. These charges are charged to the applicant at the time of making online e-TV visa fee payment. 10. What is the support available for the applicants ? 11. Can an applicant perform more than one transaction for same application number registered at https://indianvisaonline.gov.in/ ? 12. What happens if all three transaction attempts of the applicant fail? 13. Can https://indianvisaonline.gov.in/ charge more than one time for an application ID ? 1. What is Axis Bank Payment Gateway service?. 2. What are the various payment modes available on Axis Bank payment gateway page? 3. Are transactions on Axis Bank Payment Gateway secure? The applicant after filling details on https://indianvisaonline.gov.in/ clicks 'Pay Now'. The applicant is redirected to Axis Bank payment gateway page and is presented with payment options like MasterCard and VISA. Cardholder enters his card number, expiry date, Name and CVV value and clicks 'Pay Now'. Incase cardholder Bank is enabled for 3D secure, then a page will appear for the cardholder to entire either his/her OTP/3D secure password. Else transaction would be processed. After successful completion of transaction, the applicant is redirected on to the https://indianvisaonline.gov.in/ with a successful receipt of payment. The banking charges are subject to maximum of 2.5% plus applicable taxes on the applicable e-Tourist Visa fees. These charges are charged to the applicant at the time of making online e-TV visa fee payment. 10. What is the support available for the applicants ?